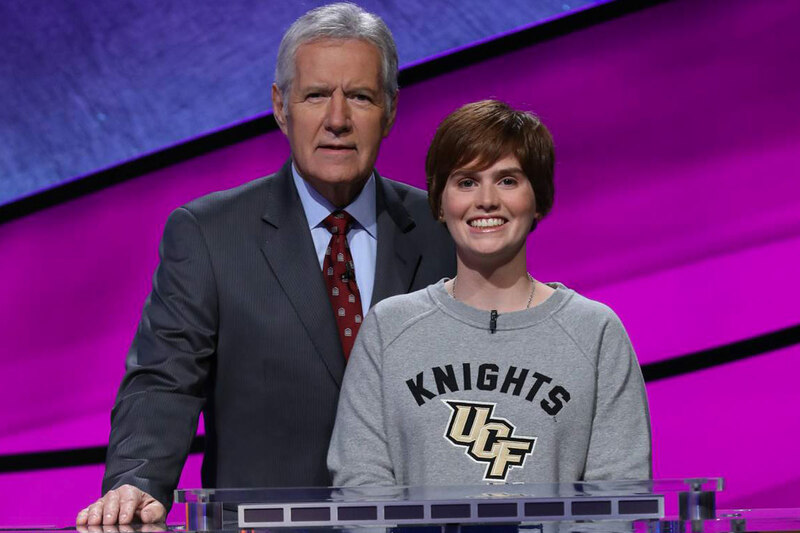 Sophomore Hannah Sage represented the University of Central Florida in the Jeopardy! College Championship finals. Sophomore Hannah Sage finished in third place at the Jeopardy! College Championship finals, collecting $25,000. Over the course of the weeklong competition, she defeated students from Darmouth College, Oklahoma University, Rochester Institute of Technology and Stanford University to advance to the finals. “I am very proud to be a Knight and to represent one of the few public universities in the tournament this year,” Sage says. Representing one of only three public universities in the competition, Sage says she was thrilled to share her love for UCF on a national scale. An avid quiz competitor, Sage prepared by participating on the UCF Quiz Bowl team, which travels around the state battling other college teams. The Manatee County student also attributes her time at UCF to helping her prepare for the academic rapid-fire of the quiz show. An honors student majoring in math and minoring in art history, Sage has developed a wide range of knowledge for the competition. The National Merit Scholar also participates in UCF programs that encourage academic excellence and help develop leadership skills. Sage’s Jeopardy! journey began with an online test. She was given 50 questions with 10 seconds to type each response. Her high score landed her an invitation to an audition in Atlanta. After passing a second test, Sage participated in a mock game show with other hopeful students. Finally, she had a short interview with producers and was told they would contact her if selected for a show. She received a call inviting her to compete last fall during final exams. Since filming began over spring break, Sage admitted the hardest part of the experience was not being able to tell her friends the results. She enjoyed packing her friends into her room for a watch party for the finals, and receiving countless text messages from those watching from afar.